Over the past couple of issues, we dug deep (!) into the Deep Stage brake package from the folks at Baer Brakes. To rewind a bit, we pointed out how this setup was engineered from the beginning for heavy, very fast street-strip cars. It consists of a vented rotor that’s built as large as possible (yet still fit traditional 15-inch drag race-style wheels). The hubs and hats are CNC-machined billet 6061-T6 aluminum, and everything from the bearings and seals to the raw material is US-sourced. They use a heavy-duty caliper mount system and the brake kits are comprehensive (pretty much a plug and play arrangement). So far so good, but what about the calipers? Here, the calipers aren’t converted race pieces. Instead, they’re heavy-duty four-piston purpose-built designs. That means the calipers are actually deeper than many you’ll find on a drag strip. The reason is they include road-going dust shields. These shields are recessed in the bore. They’re sufficiently deep so that they never come in contact with the backside of the brake pad. The seals are square shoulder configurations (in contrast to the O-ring style used by many manufacturers). The reason for using this type of seal is to produce the maximum amount of retraction. This provides the least amount of brake drag and simultaneously eliminates the need for a pair of inline residual pressure valves. By the way, the seals are both dust/weather and pressure sealed. They meet D.O.T. specifications. Part of using a deeper than normal caliper is the fact that it allows for deeper (longer) pistons. A longer piston is far less prone to cocking in the bore. In fact, when the pads are completely removed, the piston remains in the bore. With many drag race calipers, the piston tends to fall out of the bore when the pad is removed. 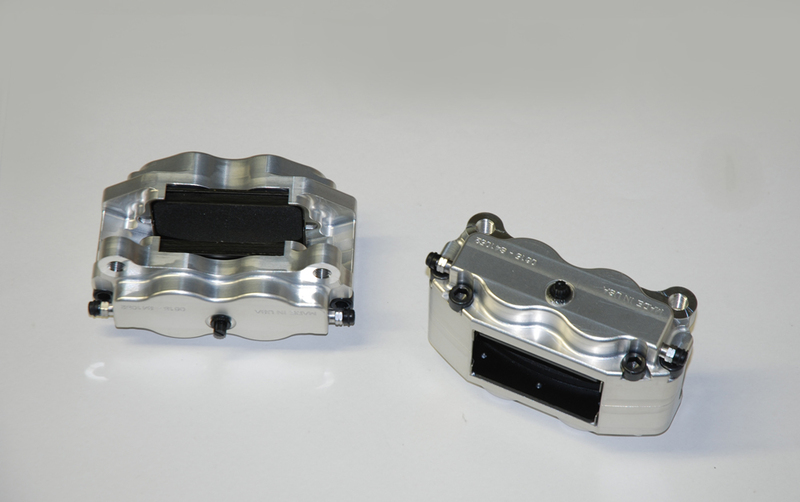 Each of the four pistons within the calipers is hard-anodized aluminum. Additionally, each caliper half is fastened by way of four 10-mm cross bolts. What this does is to provide for maximum caliper stiffness. 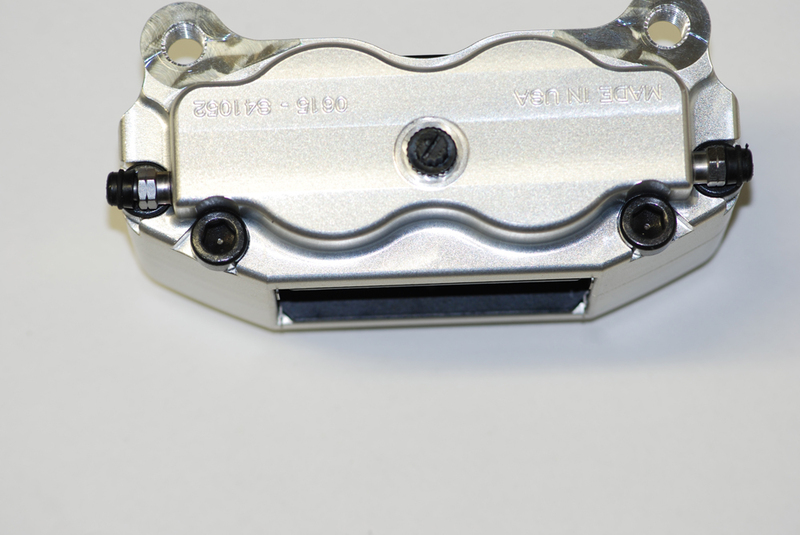 The fluid crossover design of this caliper incorporates internal fluid passages. There are no external fluid lines from each half of the caliper. Typical of all Original Equipment Manufactured calipers, the Baer S4 caliper design accepts a banjo fitting with crush washer on the inlet side. The thread is a 10-mm affair that is compatible with any number of late model brake hoses (no pipe threads are used on the components). Additionally, Baer includes a 10-mm to -3AN conversion fitting with the brakes. 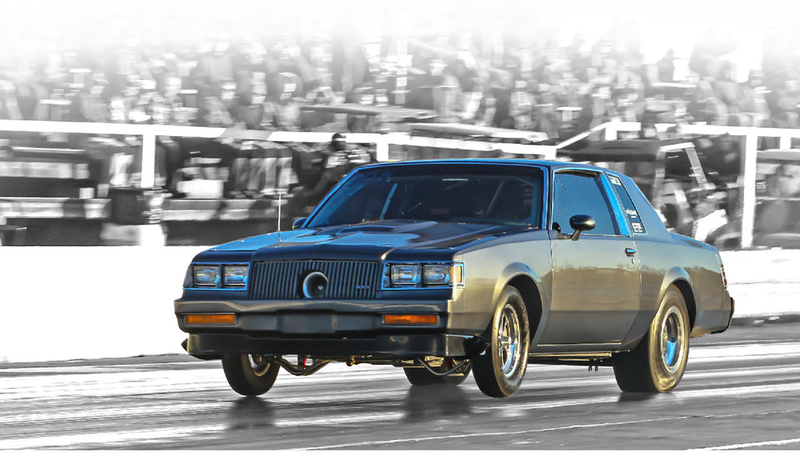 That means you can also use a very common drag races style AN brake hose. 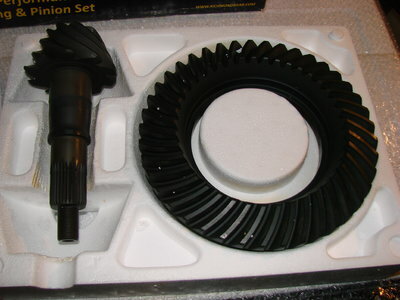 Baer even includes a special hardline adapter for cars such as the first generation Camaro (with factory disc brakes). In any case, it’s a super-clean plumbing arrangement with these calipers. Pads for Baer’s S4 configuration caliper are loaded from the bottom of the caliper. The design is such that the pad cannot exit through the top. 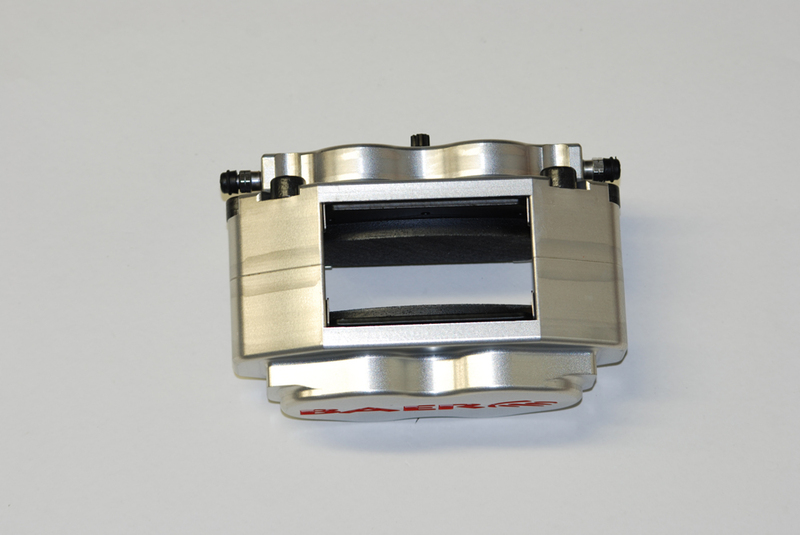 Baer uses stainless steel abutment plates to eliminate wear on the aluminum caliper body. These plates minimize pad migration and as a side benefit, eliminate excess pad noise. Pads used on these calipers are easy to source (common) 4-piston jobs. Good replacement examples include Hawks #HB100 or a #DR1 pad. Each caliper for the Deep Stage series is engineered to a specific rotor thickness. 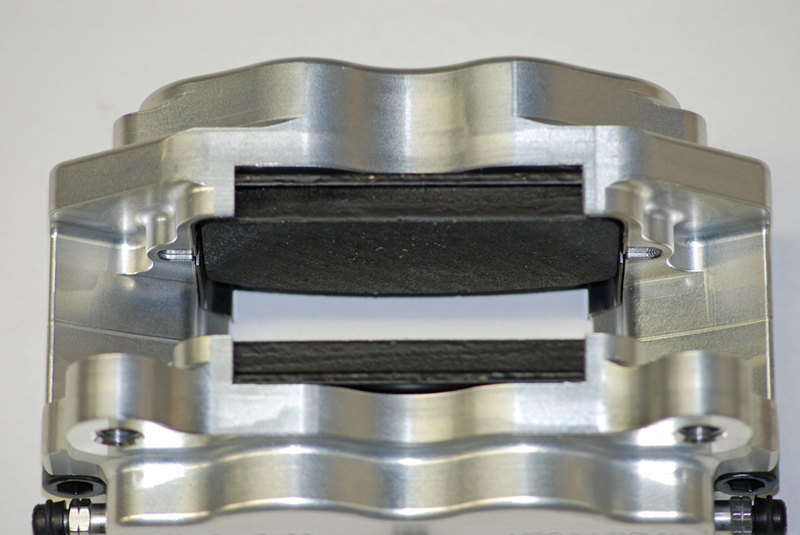 Baer notes that they do not use spacers between the caliper halves to make up for a thicker rotor. Typically, the Deep Stage kits are designed for use with 1.00-inch thick rotors. But for specialized applications, the Baer S4 caliper can be supplied for rotor thickness as small as 0.400-inch all the way to 1.375-inches. 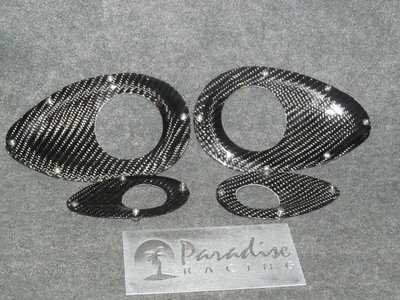 Each of the front calipers for the standard 1.00-inch thick Deep Stage rotor weight 4.10-pounds. Rear seat calipers are slightly lighter at 3.78-pounds. Yes, they’re heavier than common drag race calipers, but they’re obviously more robust, too! When it comes time to order a Deep Stage brake kit, you have a lot of options (we covered the rotor options previously). For calipers, there are more than a dozen color choices, and if that’s not enough, Baer can also provide you with a wide range of custom colors. 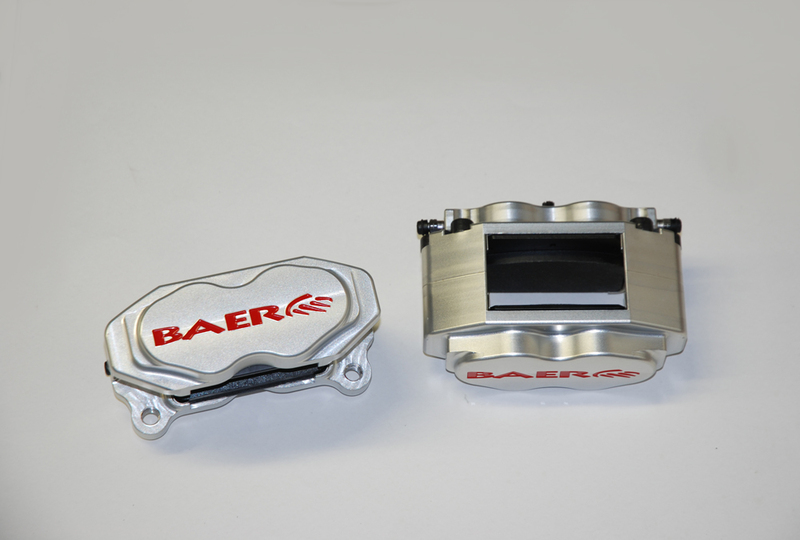 The calipers shown in the accompanying photos are clear anodized with a red Baer logo. Although the focus of our series has been on the front Deep Stage system, we should mention that Baer also offers a wide range of specialized Deep Stage Brake kits for the back axle as well. 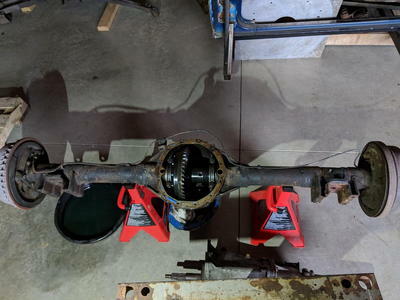 They can provide them in single four piston caliper formats or for boosted applications (or for that matter, any high HP car that leaves off the foot brake); Baer offers a dual caliper brake setup. It consists of two four-piston calipers per rotor on the back, and as you can well imagine, it provides for considerable clamping power. As you can see, the entire brake system is a well-thought out, comprehensive package. And it’s geared squarely at the guy with heavy, fast street strip combination. Next issue, we’ll wrap up our look at Baer’s Deep Stage brakes with a look at their brand spanking new master cylinder. And it’s a sweet heart too! Stay tuned. The caliper used in the Deep Stage kit is Baer’s S4 (four piston) configuration. 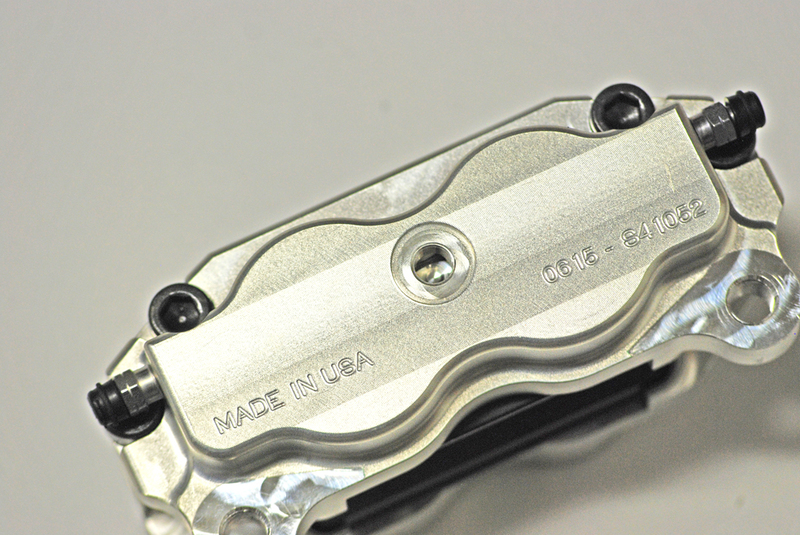 Calipers are machined from 6061-T6-billet aluminum. This example has been clear anodized. More info with regard to color combinations in the text. Brake pads are common four piston jobs (for example, Hawk Brake pads). They can only install through the bottom. Baer doesn’t use a “universal” caliper and then make up the differences in rotor thickness by way of spacers. Instead, each caliper is engineered for a specific rotor thickness. Standard rotor thickness is 1.0-inch in the Deep Stage brake systems. Caliper halves are held together with four 10-mm cross bolts (two are tucked behind the respective bleeders). Fluid ports are 10-mm. 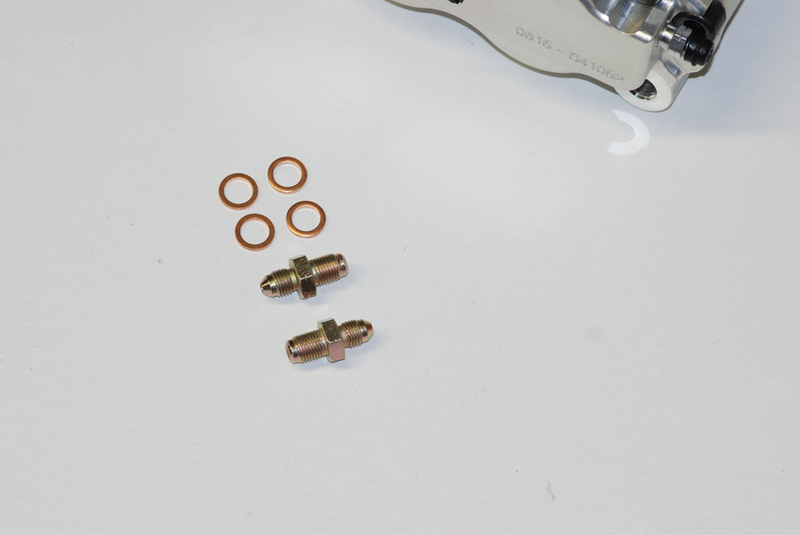 This allows you to use a common banjo style brake hose with a copper washer or (second photo) you can use the supplied 10-mm to -3AN adapter fitting included with the kit. 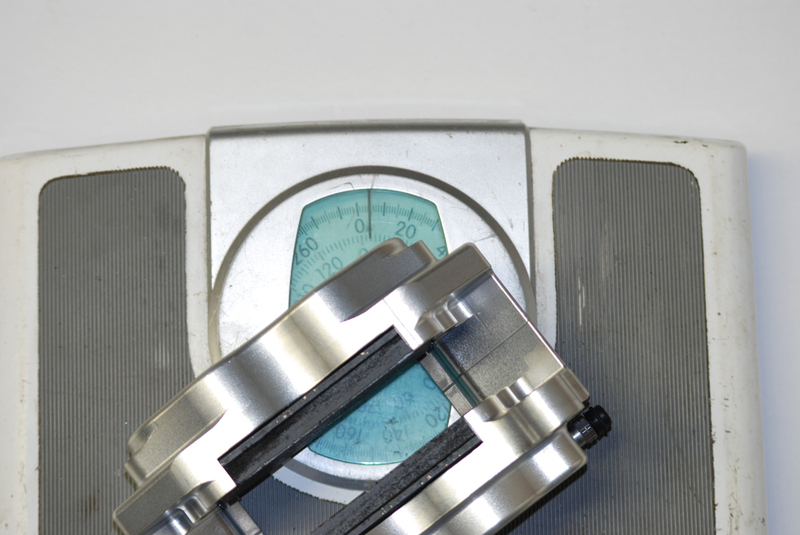 The standard front caliper weighs in at just over 4-pounds.